The complete code of this article is compiled with tut to make sure it is complete and works. We use Cats version 1.0.1 and the sbt plugin kind projector version 0.9.4. Next we will define an abstract user validator. We will only say that the validate function returns a user, wrapped into the abstract type F.
This has some benefits. Since it is often an important design choice which wrapper type to choose for F we defer this decision as long as possible. Additionally it allows us to use different interpreters in different contexts, say one for testing and one for production. At this point we can already implement a simple Id interpreter that does no validation at all. It just constructs a user instance and returns it. If we want to call the validate function, we have to have an implicit instance of UserValidator[F] in the scope. 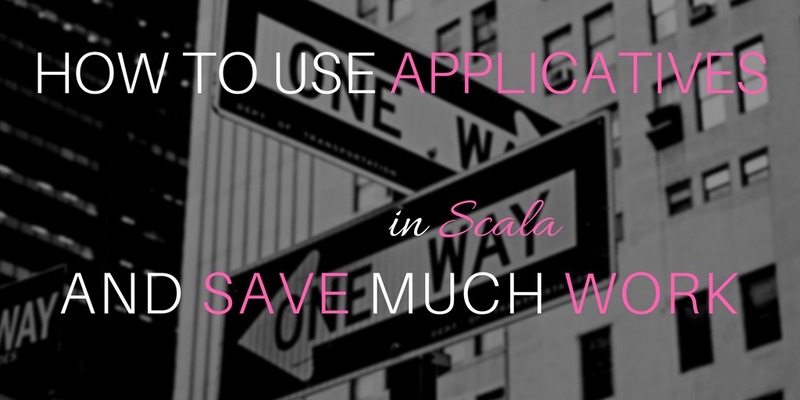 Ok, let’s now look at how applicatives can help us with real validation and error handling. Applicative is a type class that can be mapped over. And is has two operations called pure and ap. pure is just a constructor that lifts values into an Applicative. ap or the infix version <*> applies a value to a function, where both the value and the function are wrapped inside the same Applicative type. So if F is the type of our Applicative we can apply F[A] to an F[A => B] to get an F[B]. It works just like normal function application, only that everything happens inside the F.
Note that the type B in F[A => B] can also be a function. Therefore we can continue to apply values to our F until we are left with a final result. The parentheses are for clarification and can be omitted. Note that the function inside the F has to be curried. With these semantics it is possible to implement an instance for F that encapsulates conditional logic that we can use for error handling and validation. Fortunately we do not have to implement such instances ourselves. They are already provided by Scala Cats. In fact every monad instance such as Option or List e.g. has also an Applicative instance. Because we still do not want to commit to an applicative instance too early we are going to implement the validation logic in an abstract way. Regardless of what type we are going to use for validation later we only want to implement the validation logic once. To do that, however, we have to have at least one constraint for our abstract type F: It has to have an instance of ApplicativeError. Which is a special kind of applicative. It has an additional error type and additional operations. Of which we are only going to need raiseError. The applicative instances from Cats have different error types. Some have Throwable or Unit. Others have generic error types. And yet others have generic error types with constraints. Therefore we have to tell our generic validator how to construct an abstract error type from the concrete type that we just defined. We do this by passing a function UserValidationError => E to the UserValidator constructor. Let’s implement functions to validate name, age, and email address. Each function returns either a valid value or an error wrapped into the abstract type F.
Finally we will combine the validated name, age, and email address with applicative composition. Now it’s quite easy to create concrete UserValidator instances. We have to provide the target type, the error type and the error constructor function. Here are some examples for Option, Try and Either. As we can see from the results, it works. Only error messages are not collected. If we want to collect error messages we can use the type Validated from Cats. The only constraint here is that the error type has to have a Semigroup instance. This holds e.g. for List or NonEmptyList. So as long as this holds (and the compiler will tell us) we don’t have to worry about this detail. Then we were able to define UserValidator interpreters for Option, Try, Either or Validated. With almost no overhead. And Without duplicating any validation logic. When changing the target type later, we can leave the application code untouched. We merely have to replace the implicit interpreter. I think this is really cool. Also note that the code is purely functional. And we didn’t have to implement any low level logic for collecting messages. This is handled by the Validated type and just works.